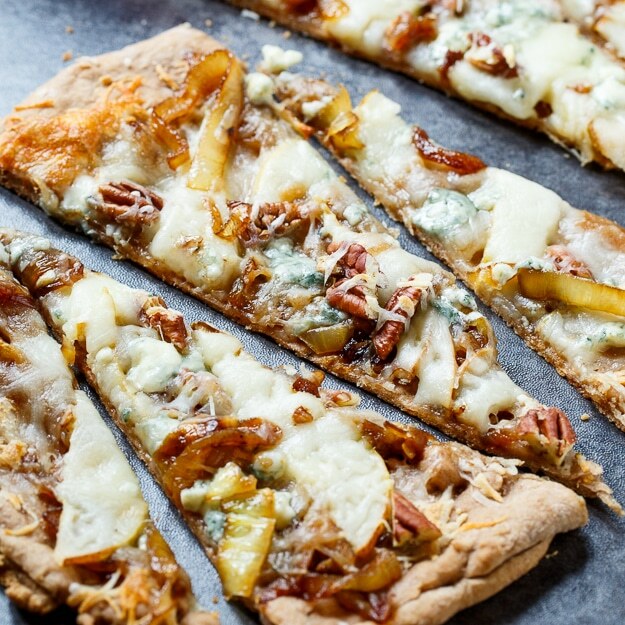 Cheesy Caramelized Onion Flatbreads are covered with thinly sliced pears, caramelized onions, crumbled blue cheese, chopped pecans, chopped fresh thyme, and gooey mozzarella cheese. The crust is made from White Lily’s Premium White Grape Seed Flour Blend and it’s a super easy dough to make. Make these flatbreads for a holiday party and your guests will think they are being served restaurant quality gourmet food. White Lily Flour has been the preferred flour for biscuit-making in the south for generations. Earlier this year, White Lily introduced three new Premium Flour Blends: All-Purpose Wheat, Wheat and White Grape Seed Blend, and Wheat and Red Grape Seed Blend. Every at-home baker needs to give these high quality flour blends a try. They are amazing to bake with. White Lily’s Premium Flour Blends are made from Shepherd’s Grain wheat grown in the Pacific Northwest. Read about my visit to a Shepherd’s Grain wheat field here. On each bag of flour is a traceability code that can be entered into the White Lily website to learn about the farmers who grew the grain in that particular bag. What a wonderful way to link the consumer to the producer. The All-Purpose Wheat Flour is a great all-purpose baking flour that you can use in any recipe that you would use wheat flour and the Red Grape Seed and White Grape Seed Blends are very unique flour blends that you can really have fun with in the kitchen. Red and white grape seeds, which are the by-product of wine making, are ground down and blended with the all-purpose wheat flour. Try them yourself and I think you’ll find they add a flavor complexity to your baked goods. The Red Grape Seed Blend goes really well with chocolate and I’ve been dying to try it in a crust for a beef pot pie. 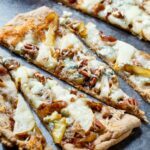 The White Grape Seed Blend pairs really well with fruit and I love the flavor and texture it gives these Cheesy Caramelized Onions Flatbreads. 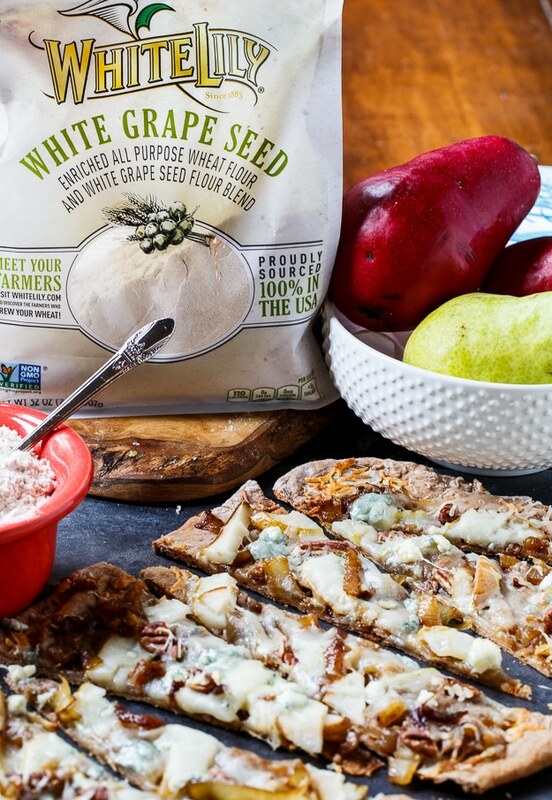 With plenty of melted cheese, pears, caramelized onions and a few pecans for some crunch, the White Grape Seed Blend crust makes an amazing appetizer. Or pair it with a salad for a light dinner. I’m excited to announce that White Lily has a brand new website and they are now on Pinterest. You can go to the website to trace the flour in your bag of Premium White Lily Flour Blend or find recipes for how to use it. 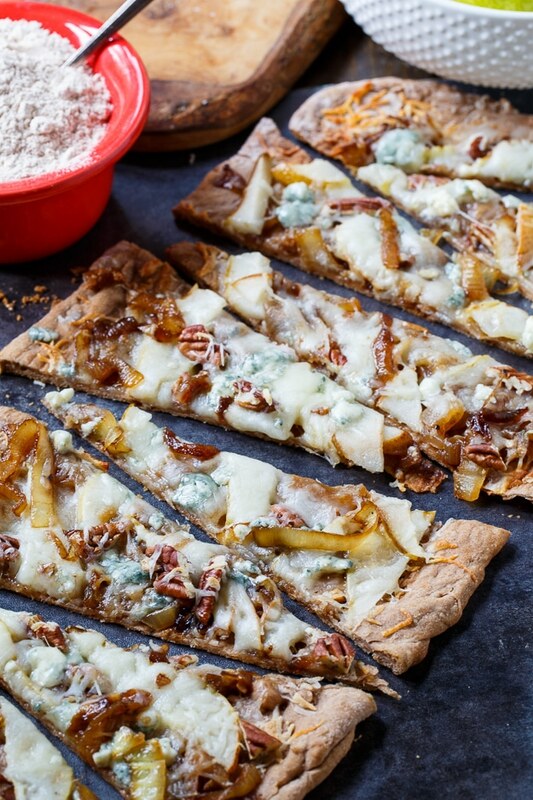 Sliced pears, caramelized onions, chopped pecans, crumbled blue cheese, all on top of a thin and crispy crust. Heat 2 tablespoons oil and 1 tablespoon butter in a large pan. Add onion and cook over medium-low heat for 20 to 25 minutes, stirring occasionally. Onions should be golden brown. Stir in balsamic vinegar, sugar, and thyme and remove from heat. Season with salt and pepper. In a medium bowl, stir together warm water, yeast and 1 teaspoon of sugar. Let sit 10 minutes. Stir flour, 2 tablespoons of oil and 1 teaspoon of salt into the yeast mixture until a dough forms. Place dough on a floured surface and knead for 1 minute. Cover and let rest 5 minutes. Heat oven to 425 degrees. Grease two baking sheets and divide dough in half. Roll each ball of dough into a 14X8-inch rectangle. Bake for 10 minutes. 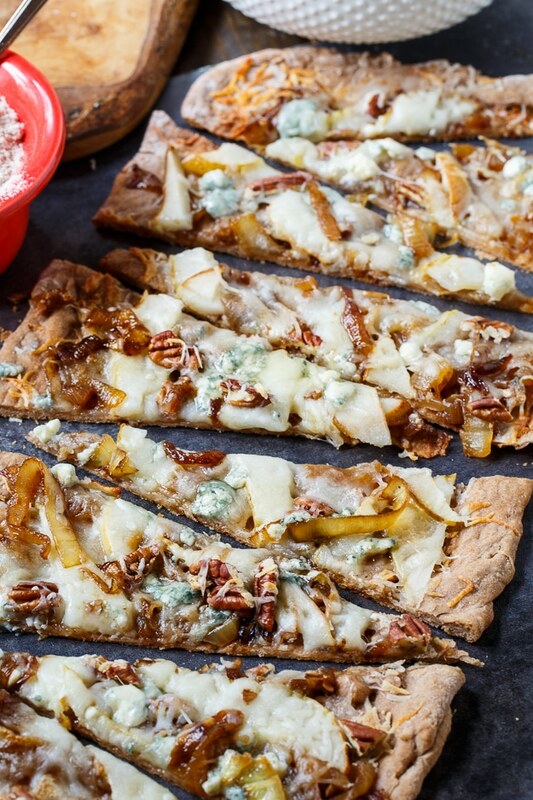 Top each flatbread with half of onions, pears, mozzarella cheese, and pecans. Bake for 10 to 15 minutes or until lightly browned. Sprinkle with blue cheese. Cut into wedges and serve. This recipe has been slightly adapted from White Lily. Disclosure: I work as a Brand Ambassador for White Lily and have been compensated for this post. I love the opportunity to share with you the products that I love and use. This entry was posted in Appetizers and tagged Pizza, white lily. Bookmark the permalink. These would make an amazing holiday party app! Love! I’m totally wishing I had this flatbread for dinner right now, Christin! That homemade crust and those toppings are just perfect. Love caramelized onions! Ok, you seriously just put ALL my favorite foods on this pizza! 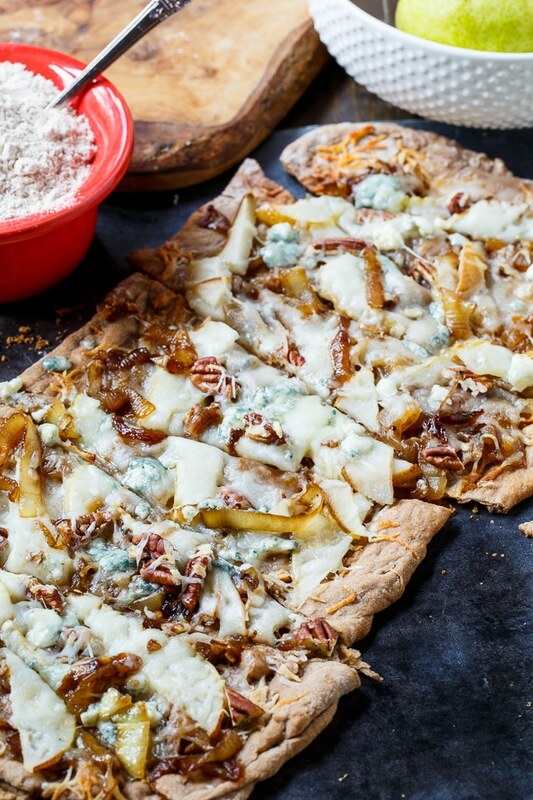 Pears, blue cheese and caramelized onions sounds like the most amazing combo EVER! I’ve never tried grape seed flour– sounds so interesting! Holy moly! I love a good flatbread and with these toppings and that homemade crust? This looks amazing! Omg! Sounds so delicious! Caramelized onions, blue cheese, pecans.. Yummy! I’m totally craving this flatbread for breakfast, Christin! This looks SO good! I love the caramelized onions on here! These flatbreads look incredible, Christin! All those toppings sound amazing – love the caramelized onions! I never knew grape seed flour existed. I’m definitely interested. This flatbread pizza looks fantastic and all of topping combination sounds incredible! This is what I need for dinner tonight!